Held once every four years the 2009 edition of the World Masters Games saw record numbers and crowds in what is the largest multi-sport event in the world. Think of it like this, the Olympics has 7500 competitors in 83 disciplines, but the World Masters 2009 edition had 28,000+ registered athletes across 149 disciplines, a huge logistical effort. 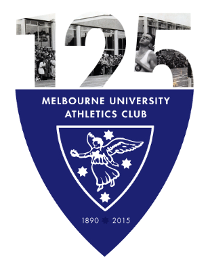 In this edition Melbourne Uni was represented by 3 athletes hoping to build on previous games. In 2002 Irie Hill set a games (and world age record) in Melbourne taking out Gold in the Pole Vault and also took out Triple Jump and High Jump gold. 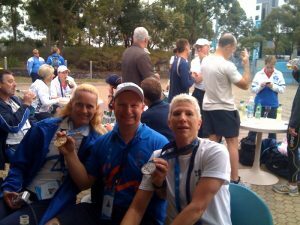 Warren Hill took out gold in the Pole Vault and a silver in the triple jump whilst in the 2005 edition held in Edmonton Lyndsey Cattermole took an unexpected Gold in the vault. All 3 came into this meeting with some differing levels of expectations. First up was Lyndsey who had decided to enter the Pole Vault and Hurdles (which she hadn’t run for approximately 40 years) and thanks to some swift Manfred coaching she was feeling confident. In the vault she was up against world record holder Phil Raschker from the USA who has never lost a Masters pole vault event. Both athletes entered at 1.60m and as the heights got higher both also improved in technique until first time clearances by Phil at 1.90m and 2.00m (as opposed to Lyndsey’s last chance saloon jumping getting every bar on the last attempt) put her in the lead. Despite very narrow failures at 2.10m Lyndsey failed to clear her equal PB then she bowed out leaving Phil to take gold. (more on the Phil/Lyndsey rivalry later). Next up was Irie, who had not actually touched a pole since setting a world record in August at the World Masters Athletics championships due to a strain in her achilles and was not sure if she would be able to jump at all. Trooper that she is she warmed up off a very short 6 step run and knew she could clear a bar before moving back to 10 and then 12 steps. In the competition with her was a South African athlete with a 2009 best of 3.50m so there was going to be a real competition if Irie could not get going to her usual standard. Both athletes elected to enter at 3.30m with Irie clearing first time and Eva on her third attempt, the bar then raised to 3.40m and Irie passed. Eva failed her 3 attempts leaving Irie with the gold medal so she raised the bar to 3.60m and despite 3 close efforts (one of which broke the bar) she was unsuccessful. (Note Irie subsequently cleared 3.60m at the Uni on Saturday in an Interclub competition). Finally the coach himself continued his amazing 2009 run which included gold at Vic Masters, gold at Australian Masters, gold at UK Masters and finally silver at these championships with Howard Arbuthnot setting the standard taking gold with a jump over 4m. Very content with silver (any medal at world level is great) Warren will now think about actually getting fit for the 2010 season ;-). Lyndsey then shocked herself and all the supporters who were cheering her on by taking bronze in the 80m hurdles behind Phil’s world record run and was very narrowly beaten out of silver. All in all a fantastic performance for the “oldies” in the team.